Why are business owners willing to invest in design and print costs only to skimp on their words? For sure it’s important your marketing looks good and arrives in your prospects hands looking like the real deal. BUT if the message is all wrong, you’ve potentially thrown good money down the drain AND missed out on sales. Your message will make the difference and that’s why being able to write for your business is such an important skill to either learn or outsource. OK this sounds really obvious but I find a lot of business owners don’t know their target customer that well. And the results are detrimental. You see, if you can’t picture in your mind who you are talking to, you’ll only ever create a generic message. And by appealing to everyone, you end up appealing to no one. In turn your sales message falls flat and you get disappointed. In comparison, if you understand your customer’s pain, what will motivate them to take action, how they make their buying decisions, what they’re struggling with etc. you can address these concerns through your copy. And the result? You’ll instantly appear more relevant and interesting. And whilst you may not appeal to so many people – often this is a good thing. You see, If potential customers self select, it means you can reduce the amount of time, effort and money spent on attracting people who in reality are not a good match for you and your business. This second tip will help you structure and focus the direction of your message. It’s all about having a clear idea of what you want a piece of writing to achieve. You see that’s one of the BIG differences between writing good English and copywriting. Copywriting is about persuasion. So what do you want your reader to do? Your objective will vary depending on the type of writing you are doing but could include downloading a special report, buying something, joining your list to discover more about your coaching, singing up for a discounted trial etc. If you know where you want to take your reader, you can carefully craft your message and plan your structure to ensure they arrive at YOUR chosen destination. And of course, when they get there, ensure you have a clear, specific call to action which makes it crystal clear EXACTLY what you want your reader to do next. Stories, anecdotes and case studies instantly make your words more compelling. After all, people are interested in people. But the reason goes deeper than that. Humans are hard-wired to remember and respond to stories. Stories help information to stick which means as a marketing tool, they are invaluable. Case studies are also really useful as a form of social proof to back-up what you’re saying. When you talk about real people that you and your business have helped, potential clients (who fall into your target avatar) are able to see the possibilities for themselves – and that’s a very powerful way to market your business. This tip is really cool. Now most business owners try to brush objections under the carpet. They cross their fingers and hope the reader won’t think like that and simply plough on with the sales pitch. Big mistake. “The consumer isn’t a moron; she is your wife. You insult her intelligence if you assume that a mere slogan and a few vapid adjectives will persuade her to buy anything. She wants all the information you can give her”. Instead, anticipate all the possible objections to your offer and write them down. (If you know your target customer, this is often easier than you might think). Next, figure out how you will address them. Finally, weave this information into your message – even better if you can answer the objection when the question arrises. I know, it’s easy for me to say this BUT there are two very good reasons why writing more will help you multiply your profits. The more you write the easier it becomes: And whilst good copywriting does require a degree of technical knowledge, it’s also about having the creativity and insights to write interesting stuff that appeals to your target customer. And the more you put pen to paper, the more natural writing becomes. It ensures you keep in touch with your customers: I guarantee your customers do not hear from you enough. Often businesses only send out some words when they have something to sell. Not a good idea! Never forget. It’s not your customers’ job to remember to do business with you. It’s your job to stay on their radar – and the written word is a really powerful way to do this. So email more often, write an extra blog a month, send out a press release, add additional content to your website etc. Use words to build and enrich the relationship you have with your customers and your profits will multiply. I’m at my most comfortable with a pen and notebook in my hand or sat tapping away on my iMac. I just love to write and I always have. And whilst writing to sell is very different from the fairytales and fiction I used to enjoy creating as a kid, a lot of the principles are the same. But I know many people don’t feel the same as me! They are consumed with writer’s block, get turned off by the blank page and struggle to know what you write. If that sounds like you relax, because help is at hand. 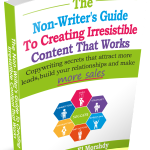 You see if you write copy for your business, you’ll want to get your hands on my FREE report – The Non-Writer’s Guide To Creating Irresistible Content That Works. In addition to some insider secrets copywriting tips, it also contains a number of practical examples to show you great copywriting in practice. Appreciating the intelligence of your prospect is absolutely crucial – unless of course you want to sell specifically to idiots! Your prospects are sentient humans and while they may not be experts in what you are selling them they do have relevant concerns which need to be addressed. Spot on, Georgina – very well put.